It’s been a hot summer so far. June was crazy hot, especially for us Vancouverites who tend to have wooly cardigans stashed away in purses, just in case, because it’s only June. To take a break from the heat, we decided to go camping a couple weeks ago. It was great. Once we crossed the border, we skipped the interstate and took gorgeous country roads all the way into the North Cascades mountain range in Washington state. We set up camp at the bug-free, cute deer-filled Klipchuck Campground that bordered the raging and cold Early Winters Creek. $12 bucks a night for a great nights sleep and close to all kinds of amazing hiking trails. I heartily recommend the short but view-filled Blue Lake hike where we tromped through snow, saw ice floats on the lake, and baby cutthroat trout swimming around in the clear, clear water. Breathtaking! After we got home, we needed more of a cool-down. I mentioned June was hot, but the start of July? Even hotter. We pulled out our tower fan and wished more places in the city had AC. So I did what I could do: make popsicles. I had recently seen Tracy’s lemon curd and fresh raspberry popsicles and decided that was exactly what I wanted to make. But I didn’t have lemon curd and I hate, hate, hate seeds in my popsicles. So I took the idea of that flavour – puckery lemons and floral, ripe raspberries – and ran with it to create this delicious creation. No seeds, ma! I’ve been making popsicles for a long, long time. 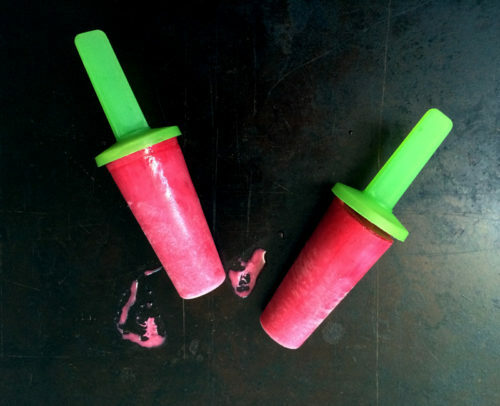 Popsicles are on trend right now, but I grew up in a Pro-Popsicle household. We rarely bought any from the store, but we made homemade ones all the time in the summer. 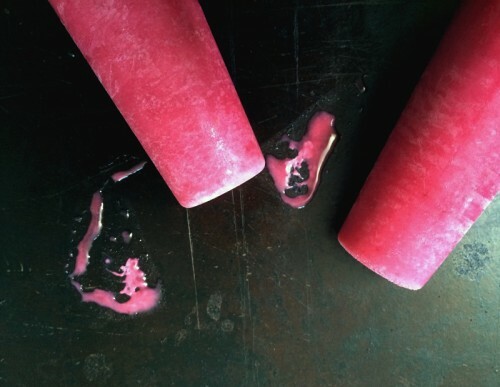 There wasn’t much originality in our popsicle flavours. 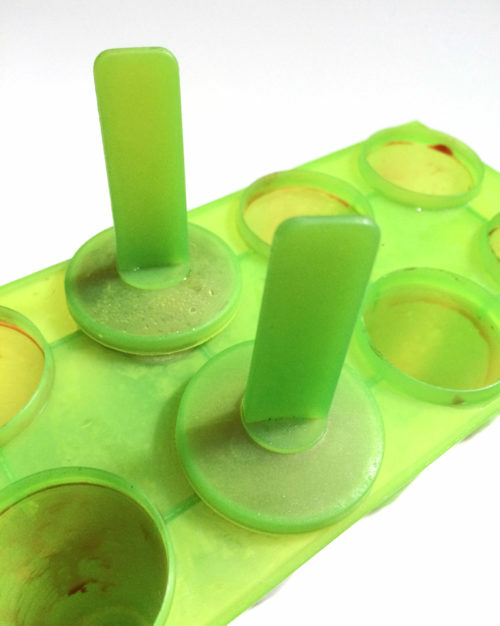 For a long time, we had orange juice popsicles – we would mix up a batch of frozen from concentrate orange juice and then pour it into our popsicle molds. Instant summer cool-down. But after a while, oj pops became seriously boring. Thank god that Bill Cosby came around when he did with his puddin’ pops! I remember we went a little nuts recreating all that chocolatey goodness at home. Whip up from-a-mix chocolate pudding and pour into popsicle molds – instant fudgesicles. 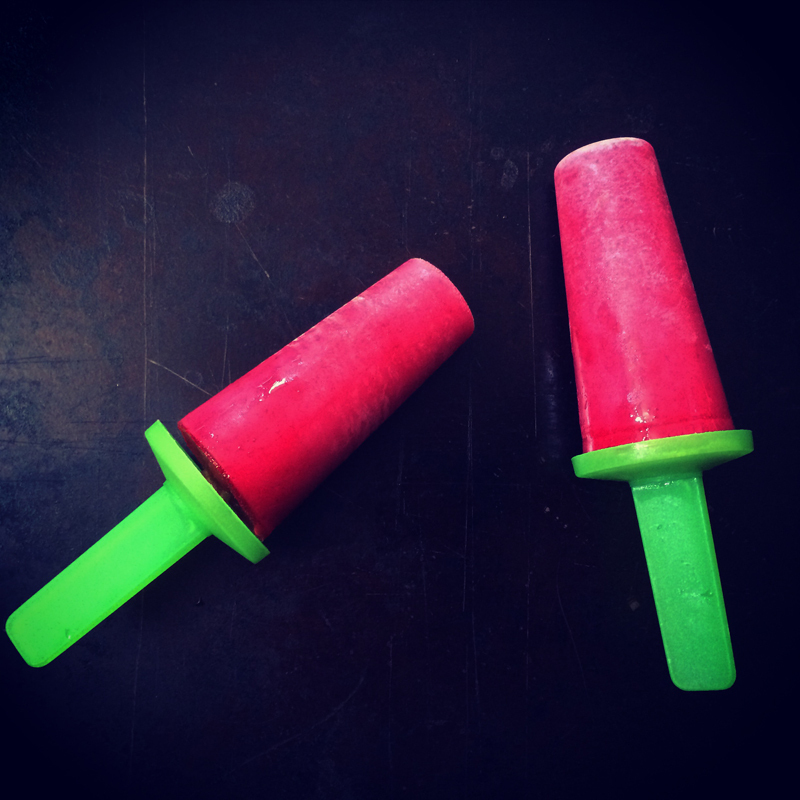 Now this was popsicle success to my young tastebuds! So, when I moved to Vancouver 20 years ago, a popsicle mold was one of my first purchases from the dollar store. 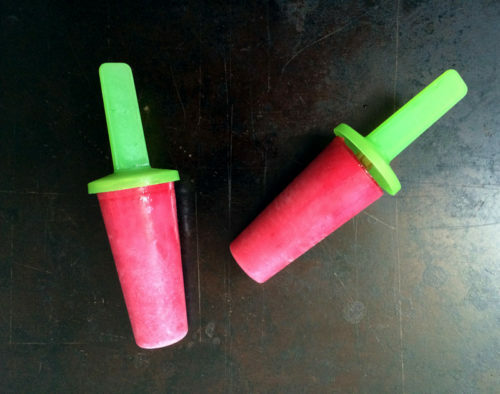 This is that exact same popsicle mold. I’m jealous of everyone’s new and improved popsicle makers and crazy retro shapes, but this fluorescent green 20 year old hunk of plastic does the job admirably. And my oh my, doesn’t it look stunning with a bright pink pop! When you’re making your popsicles, keep in mind this tip from the NYT where Melissa Clark makes ice cream. She notes that your base should be sweeter than you think it should be, because once your mixture freezes, it tastes less sweet. So I applied that line of thought to these popsicles and added in a good amount of honey to my lemon and yogurt mix. And I also added a pinch of salt to bring out more of the flavours. The end result is a sweet but tangy popsicles, popping with intense flavours. Thanks, Melissa Clark! In a medium sized bowl, let the raspberries and sugar mingle together until macerated. Or if using frozen, stir well to melt the sugar into the berries and liquid. Use a fine mesh strainer and a rubber spatula to separate the juice from the seeds and pulpy matter. Keep the juice, ditch the rest. Set aside. Add the yogurt, honey, lemon juice and zest in another large bowl and mix well. Slowly pour the raspberry juice into the yogurt and stir until well combined. Pour into popsicle molds and freeze, about 4-6 hours. Eat as desired. Makes 10-12 popsicles. This recipe sounds delicious and I’m keen to give it a whirl. I’ve been searching at the local dollar store for a sturdy popsicle mold but they all look so flimsy and poorly made so must hold off on the popsicles, until I find me some good ones. It really HAS been a hot summer! I am definitely glad for frozen treats like this. So deliciously fruity! Woq! sounds like you found a great place to camp and hike. 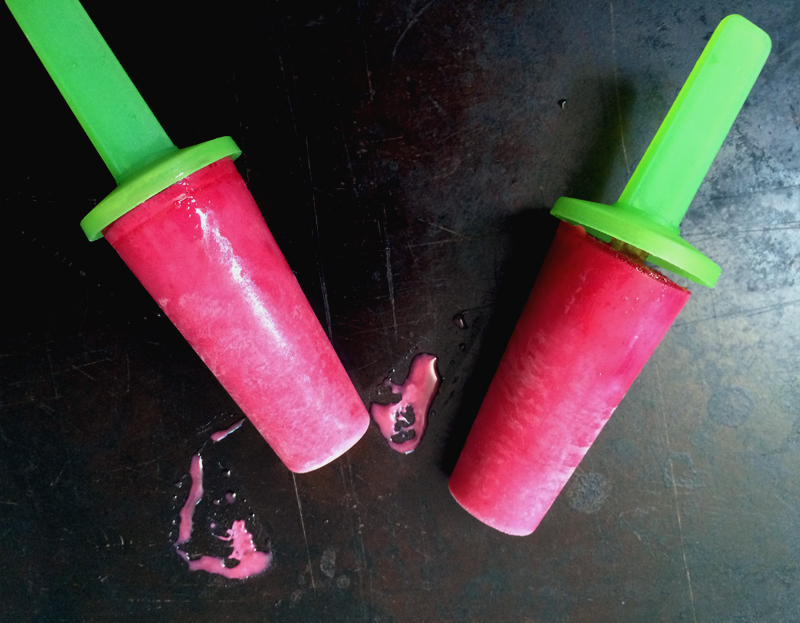 Love these popsicles, they sound so refreshing! Thanks Joanne! I love the colours too 🙂 I have 2 sets of popsicle moulds and both are from the dollar store – they’re fine. Not amazing, but they work! Joanne, it’s now cold and rainy here. AGH!! The sun and warm temps will be back tomorrow, thank goodness. Cheri, it was a great place for a relaxing little getaway. Thanks! I’m also going to check out Blue Lake, it looks wonderful! Hey, I noticed that your links don’t open up in a new window… I had to sign in again to finish reading about those Popsicles. Yum! My ice pop molds came from Ikea… might of cost $1 too. Piper, it sure is a great place. Yes, we made the site on purpose not to open in a new window as we like the user to take control over their own viewing rather than have the site make all the decisions. I always open up new links in a new tab manually by hitting the control key on my mac. Most browser sessions expire after 20 minutes or so anyway so if you read about Blue Lake and then came back, it may have expired anyway. But thanks for letting me know!! we always made ours with kool aid when i was a kid and i have the bad teeth to prove it! RMW, as a kid I was jealous of all the kids who drank kool aid!! I went through a phase when I moved away from home and bought kool aid and tang often just to get a taste of what I was missing out on!